How often have you heard the phrase, "If the wheels aren't turnin' we're not earnin'"? At Samsara, we hear it from our customers all the time. In fact, 2018 FMCSA research shows that trailer detention costs motor carriers in the truckload sector up to $302.9M annually. While most delivery contracts allow shippers to charge a fee when their trailers are detained, it's often your driver's word against theirs when it comes to proving culpability. That's why we've developed the Detention Report, to provide our customers the data they need to maximize their productive road time and enforce their detention fees with confidence. 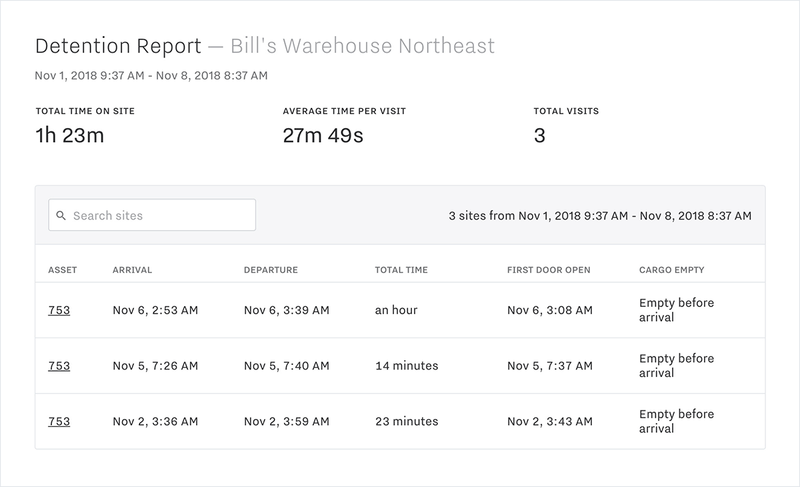 With the Detention Report you'll be able to see detention hours by location and trailer, providing detailed insights into detention frequency and duration. New levels of insight into your operations with reliable and real-time data. 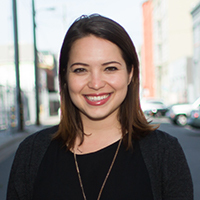 Dollars back in your pocket either by enforcing detention fees or using data to improve customer behavior. The Detention Report provides detention information by location as well as by trailer. 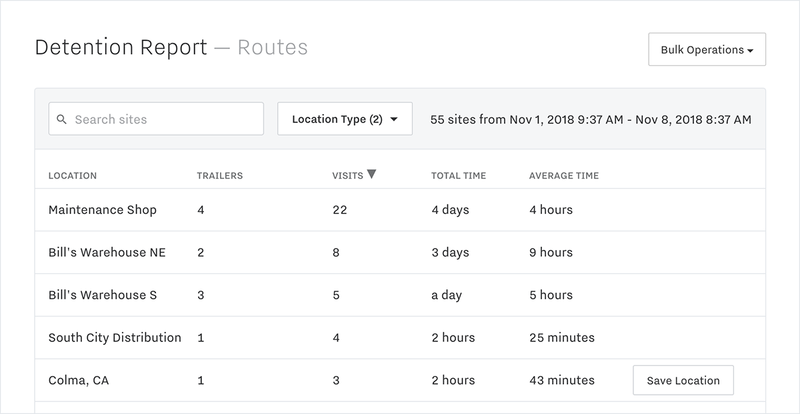 This allows you to see how long your trailers are spending at known (and unknown) locations, as well as average time spent at each stop. The Detention Report also integrates with sensor data from our door monitors, and cargo monitors, to provide an even clearer picture of what is happening when your trailer arrives at the dock. As you drill down into the data you can identify consistently slow stops and investigate delays, reach out to drivers to understand causes of detention, and find patterns among drivers or drop-off locations. With this data in-hand, you can make improvements to your routing and better forecast arrival times. Having accurate, real-time data on trailer detention gives you a new level of insight into your day-to-day operations so you can find ways to improve efficiency. When you have detention data you can rely on, you can have more frank and transparent conversations with customers who consistently slow-down trailers. Whether you immediately start enforcing your detention clauses and collecting detention fees, or use the data for leverage in contract negotiations, having hard data to support your claims gives you a much better chance of making meaningful improvements to your bottom line. The Detention Report builds on Samsara’s complete platform by providing data to improve your operations and save you money. If you are not yet a Samsara customer and would like to learn more, schedule a free demo! Samsara has developed a new tool for unpowered asset tracking: wake on motion tracking for the AG45. Our new, ultra-compact Unpowered Asset Tracker gives customers a simple way to discreetly and affordably track all of their assets.